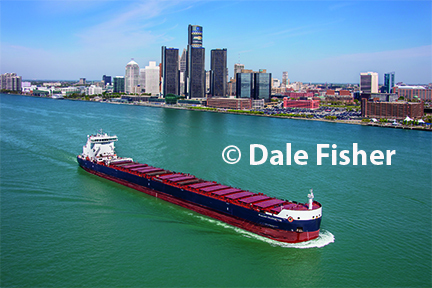 Algoma Harvester sails in front of the Renaissance Center just before she passess under the Ambassador Bridge. Saturday, August 6, 2016 we flew for two hours from Lake Orion to the Detroit River for a couple of our clients which included an excavating company and an architectural firm. We saw and photographed a lot of construction. Residential, commercial and road construction was everywhere! I understand a little more why traffic is so congested and why there are so many accidents. It is refreshing to see so much growth in Detroit. The new home of the Detroit Red Wings – The Little Caesars Arena is progressing nicely. 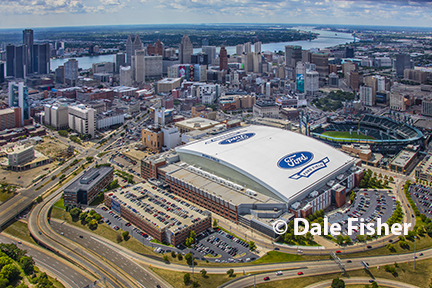 Ford Field’s new roof is completed and impressive. Although there are a lot of vacant lots, some have been turned into community gardens. Dale & I have been diligently preparing and emailing proof photographs to our clients & working on getting the word out to prospective clients that we have many photographs in our archives. I am continually amazed at the beautiful photographs Dale makes. He has a talent of making the ordinary extraordinary! We post photographs to the website regularly. We hope you enjoy these photographs from Dale’s ‘Eagle Eye’ perspective. Kindly share his art – everyone needs more beauty in their lives.